Another classmate was holding a Trump campaign “Make America Great Again” flag, and there was what appeared to be the mascot of their school on the far right. The post has been shared more than 3,000 times. Jennifer Lopez Vazquez, who wrote the Facebook post, said the incident took place during a school pep rally and Hispanic month. She said it was extremely disrespectful and that the school thinks it was fine. She said it’s white trash like to do something like this. There were many commenters on the post, with one saying the girls were white racists and shouldn’t be allowed in college. After the post went viral, local newspapers picked it up and now the school administrators are looking into the incident and questioning the event. 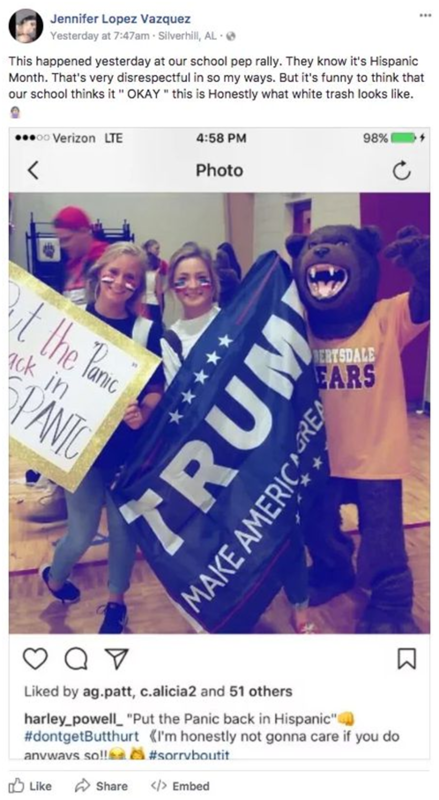 Upon learning about the photo, the school superintendent sent out a statement that said the school was made aware of a picture taken at Robertsdale High School during a football pep rally. The superintendent stated that school administrators and the superintendent’s office were looking into the matter.